You didn't open the jar? That's the first thing I would've done! It is really value for money.. ! for $30 cdn. I donch think i get this much food here. 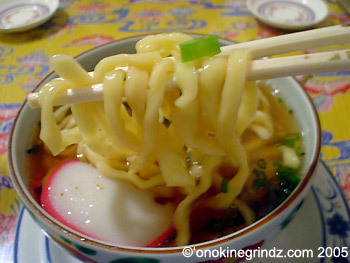 da soup looks ono brah! an get spam too! Hi Reid - How was the sushi-su? I've heard that in Okinawan style sushi, the "su" is different. I've been to Okinawan Sushi Bars and have found no difference. That looks like real "loaded" miso soup there. The prices also sound right! The jar looks like peppers. I have seen and eaten the spicy pickles ones. Yummy! I couldn't really taste any difference myself, but maybe it's because they should be using awamori in the rice. Who knows? All I know that it was delicious and reasonably priced. When I saw the special miso soup being brought out to the table, I kicked myself for not ordering it. At least I got a small taste of it. Thank you for the confirmation. I don't know if these were hot though. I should definitely try them next time. Wow! Okinawan food? I just know andagi and pig's feet. 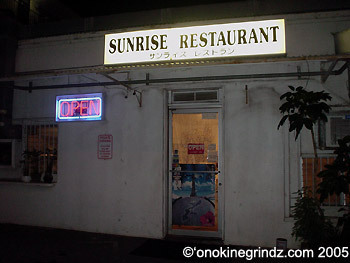 =) In fact, I didn't even know there *were* okinawan restaurants in Honolulu. Are there any other Okinawan restaurants? It's been a while, hasn't it? I've been told that there are actually a few restaurants that serve Okinawan food, but I haven't been to any of the ones I've heard about so I can't recommend them. One that I have been to is Utage, which is located near Young's Fish Market and Sugoi. The food there is pretty good and quite reasonable too. I guess I need to do a review huh? Kapahulu! Never heard of this place. Now I have to go. 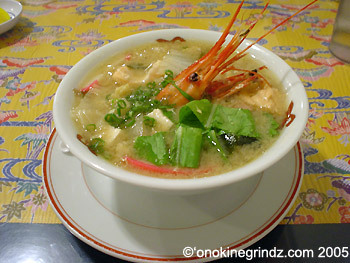 That miso soup looks wonderful! oh. mah. gawd. sunrise is soooooo good. my beau, who is part okinawan, has taken me there several times. i've had the tripe soup and the pig's feet soup and the sushi and this salmon with mayonnaise thingy wrapped in foil and then grilled....*drools while reminiscing*. granted, the place is kinda pricey (i mean, this is not fai dolla plate lunch, ya know), but for what you get, you are actually getting an awesome deal. and the people are sooooo nice...they greet the beau as if he were a long lost nephew, and when we ordered the tripe soup for me the first time we went, the sushi chef expressed concern as to whether i knew what my guy had ordered. how's that?! i swear that tripe soup made my cold go away. oh! one more okinawan food place for you to try is violet's grill on dillingham in that strip mall that has zippy's. that is where i overcame my lifetime loathing of bittermelon. you must order the goya chanpuru with tofu, egg and tuna, as well as the shoyu pork and have a couple of beers. they also have old school local fisherman style poke. ahhh...heaven! 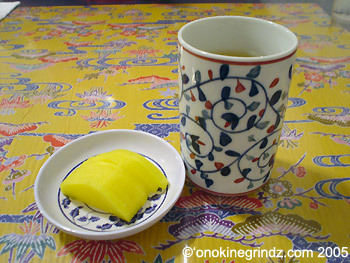 Have you tried the "traditional" Okinawan "yasai champuru" at Sunrise? It's various vegetables stir fried with slices of Spam. I nevah know da Okinawans wen invent Spam. I thought luncheon meat in the soup was quite unusual myself. But it was good nonetheless. Not many people know of this place and most of the customers are like family to the owners. To help you out, this is right next door to Waiola. Thank you for the information and recommendations! I don't really eat trip all that much, but I will try it next time. Some folks at the next table over were having it and it looked delicious. I haven't yet made it over to Violet's Grill, but I will do so based on your recommendation. Thank you so much! I have not tried the yasai champuru at Sunrise, but I will do so on my next visit. I'm sure I will like it though as everything there has been great thus far. BTW...I didn't know Okinawans invented Spam either. LOL! Excellent! I'm coming from the SF Bay Area to go the Okinawa Festival, and staying at the Queen Kapiolani. Looks like Sunrise Restaurant is just a few blocks away. I'm definitely going to hit it! Welcome to 'Ono Kine Grindz! Thank you so much for the compliment on the blog. I hope you enjoy the Okinawan festival this weekend. Unfortunately, I will be missing it again this year (I missed it last year too). I'll be out of town. Eat lots of andagi and oki dogs for me! If you do visit Sunrise, let me know what you think. At the festival, I'll be having the andadogs in lieu of oki dogs. Dogs are always better on a stick (not to mention fried in batter)! Will report back if I try Sunrise. Do you know if they had rafuti? Love the rafuti. I'm also hoping to try Royal Kitchen and Angelo Pietro for natto bacon spaghetti. Too many places to try, not enough time! I don't believe that I've seen rafute on the menu at Sunrise before, but they do have specials all the time, so you really never know. Royal Kitchen has some great manapua and although I haven't tried the natto bacon spaghetti at Angelo Pietro before, I've heard that it's delicious! 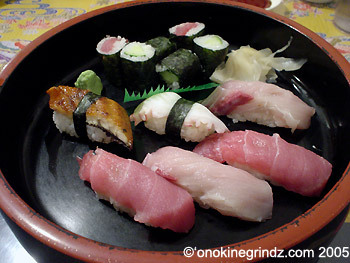 I came across your review while looking at Okinawan food. I am originally from Hawaii and I'm going to Okinawa this October for the Uchinanchu Festival - a gathering of people of Okinawan decent from all over the world. I think the jar you are looking at is togarashi, a hot sauce made from whole chilies in alcohol and is especially good with noodles or champuru. It is not the same as the chili powder referred to by the same name on mainland Japan. 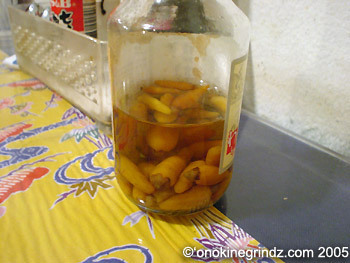 It's called, Kore~gusu in Okinawan and is a condiment staple. You can find it in most restaurants and homes, including mine. Yum! Sunrise comes highly recommended by a foodie friend of mine whose opinion on food I respect. He is also a regular at Violet's, although he said that it is somewhat pricy. Violet's serves the best mac salad and fried chix wings, among other delicacies. 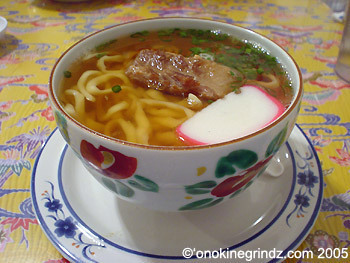 I would also recommend Hanagasa on River St for their shoyu pork, fried Okinawan soba, champaru, etc. 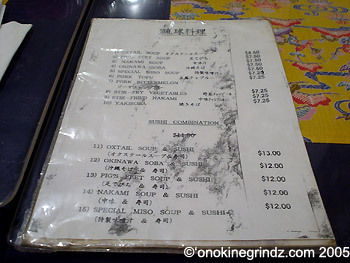 There's also an Okinawan restaurant at Pearl Kai called Off The Wall, but haven't eaten there yet.